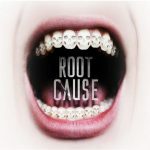 What causes existing root canals to become infected and fail? In the photo to the right you can see a common presentation of an infected tooth. 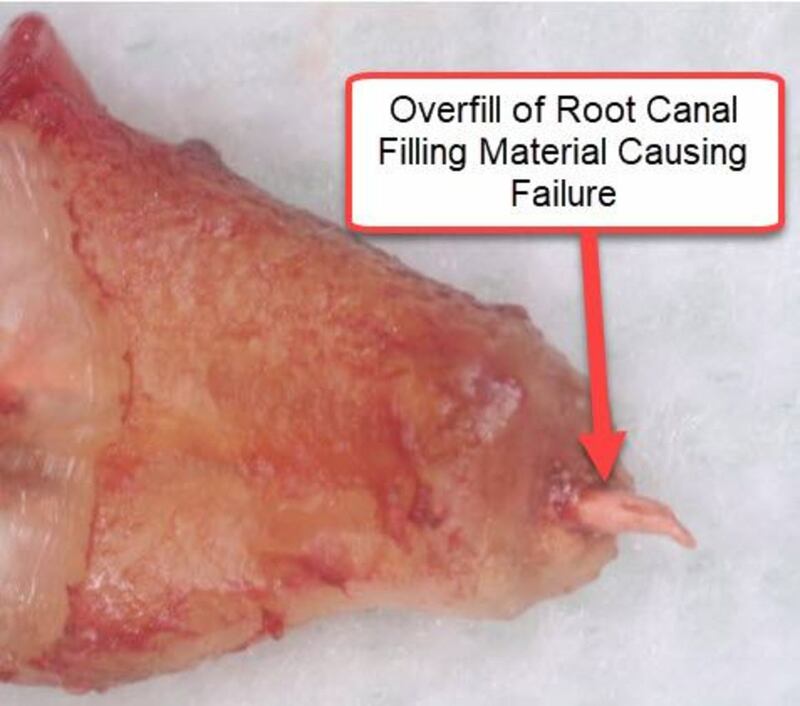 In this case, an old root canal that has failed is draining pus and infection from the tooth. 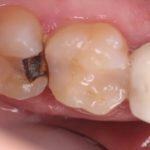 As the picture shows, the drainage presents as a pimple on the surface of the gums on the outside surface of the tooth. In blog posts to follow, I will be discussing these factors separately. 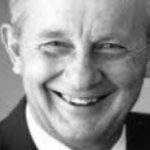 I will include case studies and photos to show how and why these problems occur. No matter what the cause of the problem or failure, the result is usually the same. 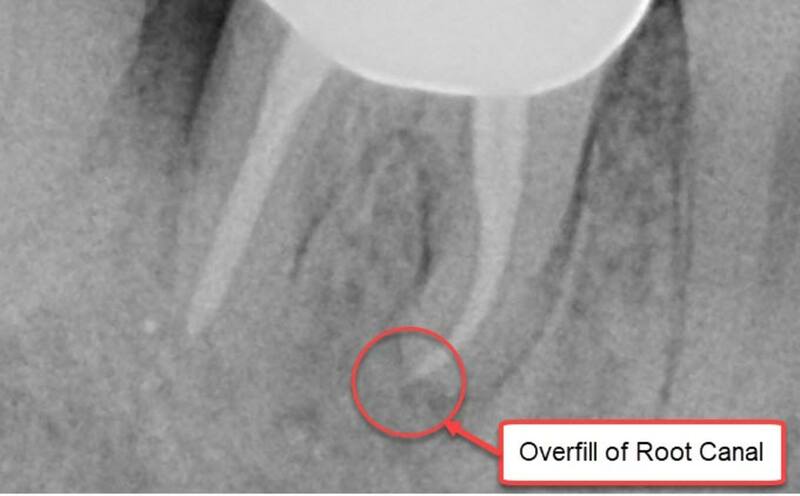 When a root canal fails, the consequence is almost always more infection. This does not always result in pain, however. 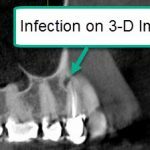 If my tooth is infected shouldn’t it hurt? You would think that if a previously done root canal becomes infected it should cause pain, right? Not necessarily. Think about it for a moment. 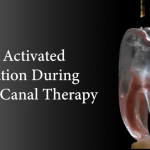 During a root canal procedure, the nerve is totally removed from the tooth. So, if there is bacteria left behind or if the tooth becomes re-infected later on, how would you feel it? There is no more nerve there to tell you there is a problem or let you know that pressure is building up again from the infection. An infection can remain for years until something upsets the balance because it is embedded in the jaw, which is hard bone, as it drains from your tooth, . 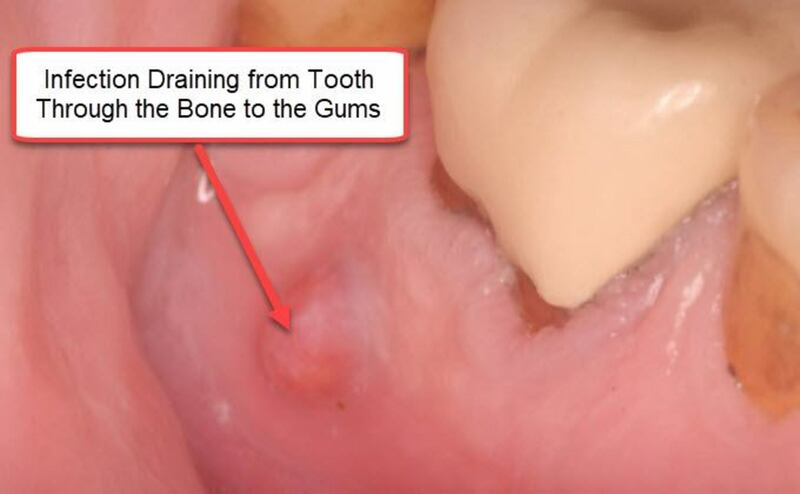 So essentially, the infection is locked in the jaw bone until it increases enough and the pressure builds up enough for it to push its way out into the gums around the tooth. Basically, the pressure builds up until it finds an avenue to push its way out. 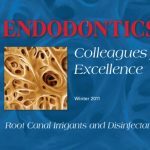 Are Root Canal Filling Materials Toxic? This patient presented with this infected root canal draining pus out to the gums, as shown in the featured picture above. There was some discomfort but no significant pain. The image taken of the tooth showed that there was a slight overfill, but most dentists would say that this is acceptable and that the root canal would still be considered a success. However, this is by no means guaranteed. Some patients react to the materials used to fill the tooth during a root canal procedure. One of these materials is called gutta percha, which is similar to latex from the gum tree. The other is a sealer. Sealers can sometimes cause inflammation in the tissue around the tooth, depending on which type is used. Even though the Xray looks acceptable, the situation was not, as the tooth was clearly draining infection and had to be treated. 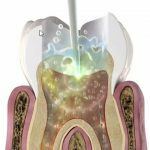 The patient was given the option of seeing a specialist (endodontist) to re-treat the root canal, or extract the tooth. 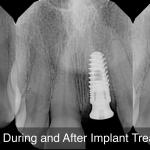 The patient chose to extract the tooth and replace it with an implant later. After the extraction was done, the infected tissue was removed from the bone so that bacteria would not remain and infect the healing site. In holistic or biological dentistry this is called a cavitation. After the extraction I was able to capture the root canal overfill in this photo. The gutta percha was pushed outside of the tooth during the filling procedure, and the overfill is very clearly outside the tooth. This created inflammation and eventually infection, resulting in the pus draining out to the gums as recorded in the first photo. You can also see the evidence of a small cyst attached to the end of the root. This is a clear example of what can happen with root canal teeth, and this type of problem is not always picked up by Xrays. Sometimes you need a special type of imaging to see what is really going on. Do you know of any holistic dentists in Cincinnati? I do not. 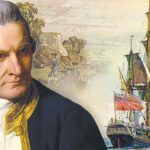 You can try IAOMT for a referral. I had a pus spot and swollen gum a year after root canal, but now a whole second year with not much happening that I can see but slightly tender gum. 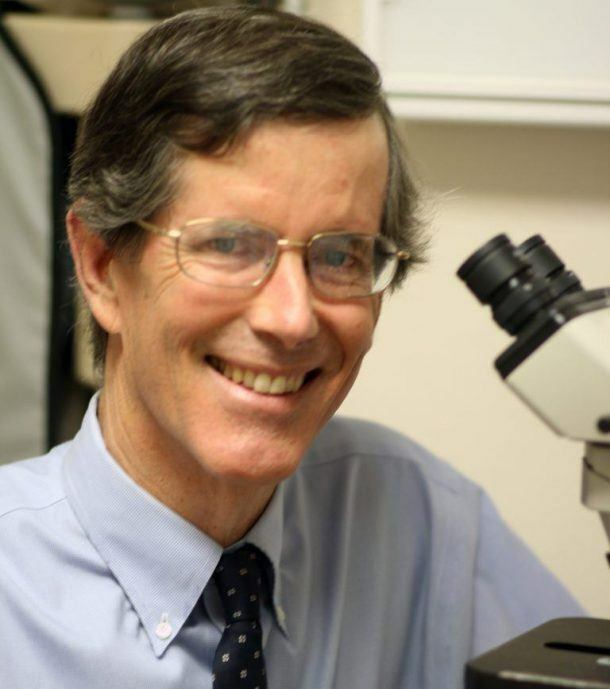 Could there be ongoing bacteria multiplying in the jaw? 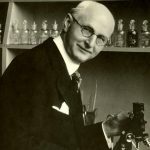 Could the bacteria have found another way out into my bone? Do I need to loose the tooth? Yes, you should definitely have this looked at. Not all root canals work and infection can linger or come back. Take an Xray of the tooth and if there is suspicion of a problem then take a Cone Beam to be sure. If there is an infection then treat it. Thanks for asking.